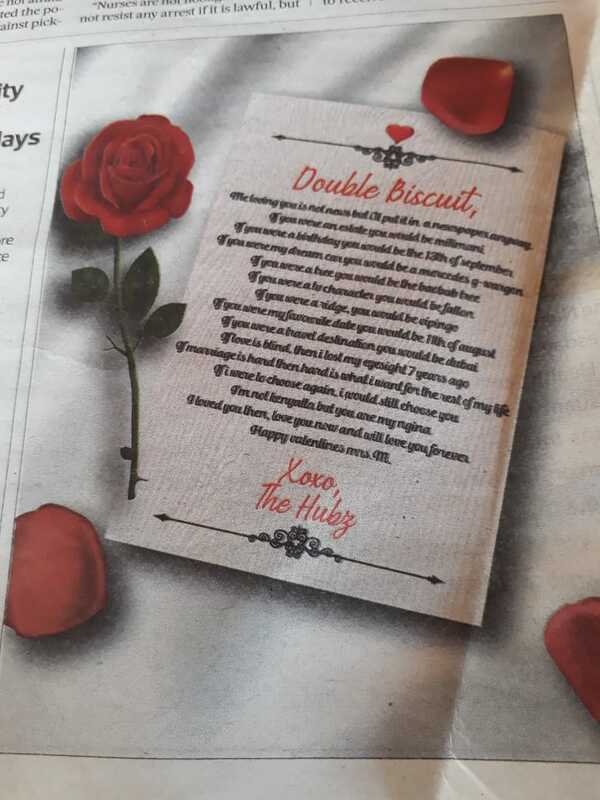 On this Valentine’s Day, a man went all out for his wife coughing up Sh63,000 for a newspaper advertisement celebrating his wife. On Page 7 of the Star Newspaper, The Hubz as he identifies himself praises his wife; Double Biscuit or his Mrs M.
He starts by saying: ” Me loving you is not news but I’ll put it in a newspaper anyway,” he gushes. Xoxo then goes ahead to compare the wife to some of his favourite things and places. “If you were an estate you would be Milimani. If you were a birthday, you would be the 13th of September. If you were my dream car you would be a Mercedes g-wagon. If you were a TV character you would be fallon. If you were a ridge, you would be Vipingo. If you were my favourite date you would be the 11th August. if you were a travel destination you would be Dubai. If love is blind then I lost my eyesight seven years ago. If marriage is hard then hard is what I want for the rest of my life. If I were to choose again I would still choose you. I’m not Kenyatta but you are my Ngina. I loved you then, love you now and will love you forever… Happy valentines Mrs. M,” he concludes his love letter. While Mrs M reads this message from a daily with a 20,000 circulation others will be marking the Singles Awareness Day (SAD).